Glenview, IL- February 26, 2013- Hammer Nutrition of Whitefish, MT and Steve Jenkins of Glenview, IL today announced a partnership for the 2013 Racing Season. Returning for the 5th consecutive season of support is BRM Chronograph. With motorsports inspiration, and manufacturing techniques, their watches are a favorite of Jenkins; “I just love BRM watches! The extent of the detail in the machining of the cases, and the exotic materials they are using is so similar to race cars”. The 28 Car will again be adorned with a watch on the hood that matches the watch on the drivers arm. This year the case of this watch will be made of Makrolon, a high-tech polycarbonate used in automotive headlights and racing windscreens among other places.It is an ultra lightweight material, making the BRM MK series of watches the lightest automatic chronographs in the world. Frederic Gasser of BRM NA added: “Since 2009 Steve has been a great ambassador for BRM. BRM is very proud to be involved in this promising 2013. We wish great success for Steve and the MK44 and this very good looking 911 GT3″After finishing with a record number of points in the T2 class of competition in 2012, Jenkins moves up to the faster GT2 class in 2013. The new car will continue to be run by the highly regarded Fall-Line Motorsports in Buffalo Grove, IL where Jenkins is the in-house driver coach. “I was at Fall-Line in the very early stages of its existence, I’ve raced with other teams, and worked for other businesses in the industry, but one thing to me is very clear… they continue to be the best at what they do. I have confidence in letting them run my car, that it is safe mechanically, driver wise, and that the method in which they go about things with their customers makes everyone a better and safer driver/racer”. About Hammer Nutrition- Founded in 1987 by Brian Frank, Hammer Nutrition offers a comprehensive line of fuels and supplements designed specifically for unique needs of endurance athletes, including racecar drivers. Hammer products are literally “health food for athletes” – being made with only wholesome ingredients and containing absolutely NO refined sugar, artificial sweeteners, colors, flavors, preservatives or chemicals. They are 100% gluten free, diabetic friendly and ideally suited for junior athletes. Besides being heavily used by traditional endurance athletes such triathletes, bike racers and runners, Hammer Nutrition products have become increasingly popular in the Paddock area of all forms or motor sports – from endurance racing to Baja 1000 to shifter karts – used while driving and in cross training to improve energy, endurance and recovery. Visit www.hammernutrition.com to learn more about the product line. Steve Jenkins is headed to Wisconsin and the Historic Road America race track to compete for the SCCA National Championship next week. The culmination of a nearly perfect race season comes in the form of a one race, “winner take all” Championship on Sunday the 23rd of September at 9:30am cst. Jenkins competed in 8 races during the regular season, scoring 7 pole positions, 7 wins, and 2 track records in the competitive Touring 2 (T2) class of the Safe Racer SCCA National Racing Series. On his way to leading the National Points with a record 133 points on the season, he also won 2 BF Goodrich Super Tour races, and his Division Championship. In doing this, he is qualified for the SCCA Super Sweep which can be won with a first place finish at the Runoffs next week. 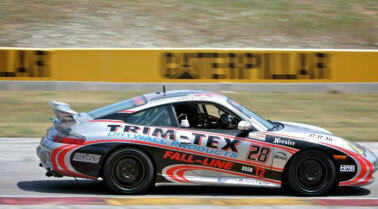 Jenkins 2004 Porsche 996 carries sponsorship from Trim-Tex Drywall Products, BRM Chronographs, HRE Wheels, Napleton Porsche, and Bemis Mfg. “Without the support of my partners none of this would be possible, and I owe them a lot of thanks! !” concluded Jenkins.